Sizerville State Park is a 386-acre (156 ha) Pennsylvania state park in Portage Township, Cameron County and Portage Township, Potter County, Pennsylvania in the United States. The park is nearly surrounded by Elk State Forest making it part of one of the largest blocks of state-owned land in Pennsylvania. 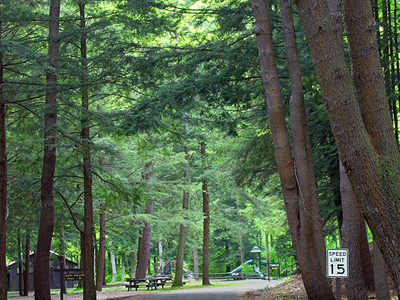 Sizerville State Park is on Pennsylvania Route 155, six miles (10 km) north of the borough of Emporium. Sizerville State Park features five different loop trails for hiking. Bottomlands, North Slope, and Campground are all on fairly flat land. Sizerville Nature Trail is a three mile (5 km) loop that features several educational stopping points. It is also a trailhead for the Bucktail Path Trail. Nady Hollow Trail climbs a 1,900-foot (580 m) mountain.The swimming pool is open to the public from Memorial Day until Labor Day. Here's the our members favorite photos of "State Parks in Pennsylvania". Upload your photo of Sizerville State Park!